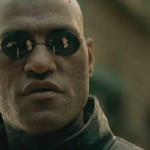 WHAT IF I TOLD YOU; NEO (KEANU REEVES) BELIEVES THAT MORPHEUS (LAURENCE FISHBURNE), AN ELUSIVE FIGURE CONSIDERED TO BE THE MOST DANGEROUS MAN ALIVE, CAN ANSWER HIS QUESTION -- WHAT IS THE MATRIX? NEO IS CONTACTED BY TRINITY (CARRIE-ANNE MOSS), A BEAUTIFUL STRANGER WHO LEADS HIM INTO AN UNDERWORLD WHERE HE MEETS MORPHEUS. THEY FIGHT A BRUTAL BATTLE FOR THEIR LIVES AGAINST A CADRE OF VICIOUSLY INTELLIGENT SECRET AGENTS. 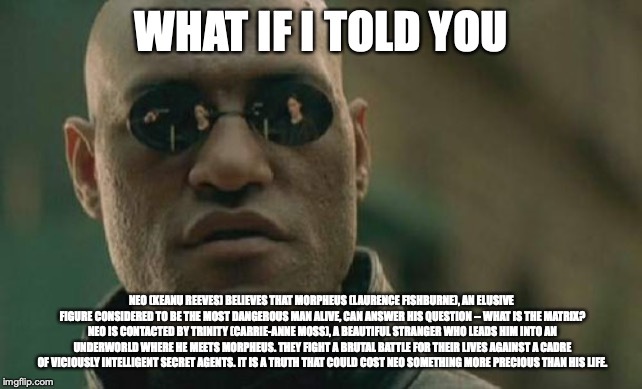 IT IS A TRUTH THAT COULD COST NEO SOMETHING MORE PRECIOUS THAN HIS LIFE.